PRESIDENT RODRIGO R. Duterte is already on his second year as the country’s chief executive, but the polls that clinched him that post continue to bedevil the Commission on Elections (Comelec) – and with reason. Indeed, despite giving the candidates in the May 2016 elections a controversial three-week extension to submit their respective election-spending reports, thousands of candidates and a dozen political parties and party-list groups still failed to submit the required documents. According to the Comelec Campaign Finance Office (CFO), 3,937 candidates in the May 2016 elections, as well as six political parties, and six party-list groups did not submit their Statement of Election Contributions and Expenditures (SOCE) by the June 30, 2016 extended deadline. The figure reflects nine percent of the total 44,603 candidates who ran in the 2016 polls. The list of nonfilers includes six senatorial candidates, more than 300 mayoralty candidates, and 244 bets for vice mayor. The bulk of the nonfilers, however, ran for councilor, with six of these actually winning in the polls. The seventh winner-nonfiler – a mayor — died even before he could take his oath of office. The rest of the nonfilers lost in the elections. 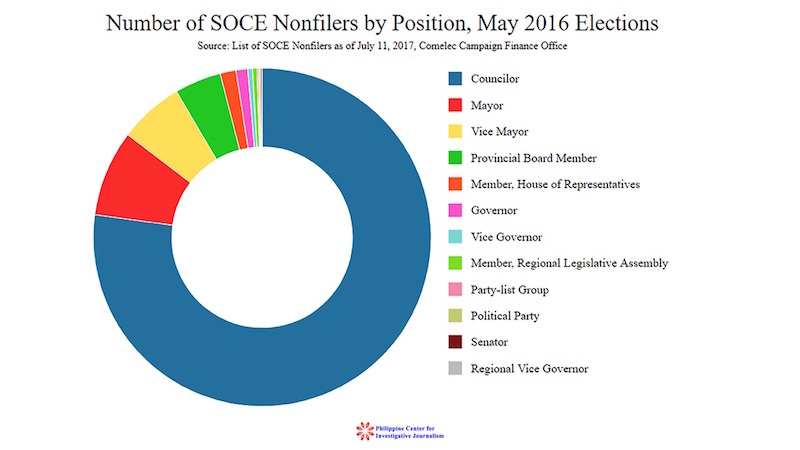 More than half of the SOCE nonfilers had declared themselves as Independent on their certificates of candidacy while about 10 percent (402) were affiliated with the Liberal Party. 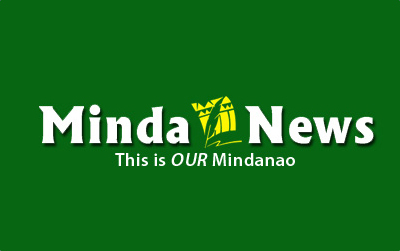 Four other parties with more than 100 nonfilers among their respective candidates were the United Nationalist Alliance (361 or nine percent of the total nonfilers), Nationalist People’s Coalition (216 or five percent), Partido Bagong Maharlika (158 or four percent), and Partido Demokratiko Pilipino-Lakas ng Bayan (127 or three percent). The Comelec En Banc received the list of 2016 SOCE nonfilers from the CFO last July 11. With the list having been noted by the Comelec En Banc, the CFO can now send notices to the nonfilers for them to pay the applicable administrative fine. CFO Acting Head Efraim Bag-id says that candidates who submitted their SOCE after the June 30 deadline are still deemed nonfilers. For a first offense, nonfilers will have to pay an administrative fine of P10,000 to P30,000 depending on the position they ran for. Second-time offenders, meanwhile, will have to pay between P20,000 and P60,000, in addition to being perpetually disqualified from holding public office. CFO lawyer Mazna Lutchavez says that the CFO is able to run after nonfilers through the contact details provided in their respective certificates of candidacy or addresses in Comelec’s voter list. Nonfilers typically pay the fine especially when they plan to run again, she says. The high court has yet to rule on the matter. Should the Supreme Court overturn Comelec’s decision to extend the deadline, the CFO staff may have to go back and review the submissions received between June 9 and June 30. The number of nonfilers could thus be higher. Last year, CFO released a list of 873 candidates facing perpetual disqualification from holding public office for failing to file their SOCE in two elections. These candidates ran for various posts in the 2007, 2010, and 2013 elections, according to CFO. In a May 2016 report, PCIJ had noted that at least 95 of these candidates were running again in last year’s elections, including one candidate for senator, eight for district representative, eight for governor, at least 33 for mayor, 11 for vice mayor, and 34 for councilor of various cities and towns. CFO’s Bag-id recently confirmed that there are nonfilers who would no longer be eligible to run for office in future elections. He said that after being declared disqualified to hold public office by the Commission, these nonfilers did not elevate the matter to the Supreme Court, thus making the decision final and executory. Court rules also allow candidates to bring such matters to the Supreme Court on certiorari within 15 days from notice of the judgment, final order, or resolution appealed from, or of the denial of the petitioner’s motion for new trial or reconsideration. CFO records themselves show that at least 22 nonfilers had been declared by the Comelec En Banc as having been perpetually disqualified from holding public office. Three of these cases stemmed from petitions filed by individual complainants, while the rest were initiated by Comelec motu propio through the CFO. Certificates of Finality have been issued to 15 of the 22 cases, which means that the candidate involved did not appeal the Comelec En Banc‘s decision. Certificates were issued for 12 of these 15 cases on various dates in 2016, while those for the remaining three were released in 2017. Writs of execution or orders to implement the decision, however, have been issued on only three of these 15 cases. 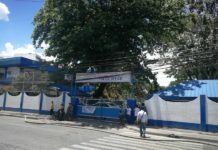 At least one past SOCE nonfiler is known to have sought redress from the Supreme Court: Joel T. Maturan who was disqualified by Comelec in September 2016 because he had failed to file his SOCE for the 2010 and 2013 elections, in which he ran for governor and mayor, respectively, in Basilan province. Allan Patiño, a registered voter, filed the petition seeking Maturan’s disqualification. Last May, the Supreme Court affirmed Comelec’s ruling to impose perpetual disqualification on Maturan. In a unanimous decision penned by Justice Lucas P. Bersamin, the high court ruled that a candidate running for an elective post who failed to file his SOCE twice within 30 days from Election Day is perpetually disqualified to hold public office. According to the decision, Maturan argued that he could not be disqualified because he paid a fine for not filing his SOCE in 2010, and that he withdrew his candidacy in the 2013 polls. Maturan was still able to join the gubernatorial race in Basilan in 2016, but lost to Hadjiman Salliman. Comelec CFO is now putting together a new list of repeat nonfilers that would take into account those who had failed to submit their SOCEs for the 2016 polls. CFO says that the list will be made available to the public after it is submitted to the Comelec En Banc. * Jovito S. Palparan Jr. (Independent). A check on previous lists of non-filers shows that Osmeña and Albani also failed to file their SOCE in the 2010 polls. PCIJ tried to reach Albani by phone and email and Osmeña by email but failed to get a comment from either. South Upi, Maguindanao Councilor Warlito D. Pinuela. * Kilusang Diwa ng Taguig. Comelec data show that the Centrist Democratic Party of the Philippines fielded at least 43 candidates for the 2016 polls. Three of these candidates won: Alaminos City Councilor Margielou Orange D. Humilde and Cagayan de Oro City Councilors Teodulfo E. Lao Jr. and Enrico D. Salcedo. 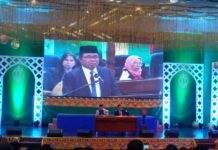 By geographical area, more than 40 percent of the SOCE nonfilers or 1,765 candidates came from the Autonomous Region in Muslim Mindanao (ARMM). Calabarzon had the next highest number of nonfilers with 248, followed by Northern Mindanao with 228. In terms of compliance rates, ARMM had the lowest at 56 percent, followed by Metro Manila at 88 percent. 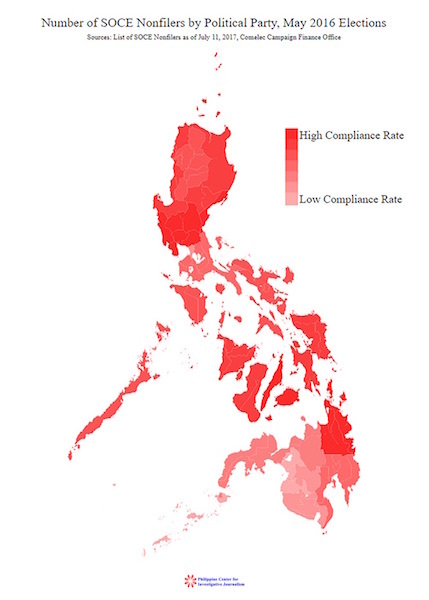 Central Visayas, Caraga, and Central Luzon posted high compliance at 97 percent each. The national average is 91 percent.